What if Exxon had told the truth? About 25 years ago, Exxon made a conscious decision to stop providing the public their scientific opinion concerning the likely effects of carbon dioxide emissions on future global temperatures. Up to that point in time, Exxon scientists had been leaders in the field of climate change research and had provided reports to both their Board of Directors and to the public at large. That research had caused Exxon scientists to suspect that the effect of our increasing atmospheric CO2 levels on future global temperatures might require corrective action. In fact, within their own company, Exxon did take action concerning their operations in Arctic regions where climate change was expected have particularly pronounced effects. Then in 1990, Exxon’s CEO and Board of Directors became even more concerned about the negative effect this new scientific information might have on their own business. For this reason, they decided to change their strategy concerning climate change research. They stopped doing it themselves and, instead, decided to put their money behind a public campaign designed to spread doubt on the similar scientific conclusions being drawn by all other scientists on this topic. They did this via their own advertisements and their financial support of organizations and individuals who shared that goal. Therefore, since 1990 Exxon has been telling the general public and our elected officials that we don’t know enough yet as to merit corrective actions. In addition, they have urged us to allow the fossil fuel industries to continue to “drill, drill, drill” in a quest for finding more gas and oil reserves. For their intentional misrepresentations of science of climate change, I believe that Exxon (now ExxonMobil) should be prosecuted. Surely, our criminal code includes statutes that aim to prevent harm knowingly done to the public merely for a corporation’s financial gain. My previous post on this web site focused on that point and I will not repeat that argument here. Instead, I will refer you to another article bearing a similar title – “Imagine if Exxon had told the truth” by Bill McKibben (see it at http://www.theguardian.com/environment/2015/oct/28/imagine-if-exxon-had-told-the-truth-on-climate-change). In his article you will see how we could have avoided many of the tragic setbacks that will result from our last 25 years of ignorance and conflict on this subject – which could have been avoided if the most lucrative corporation in the history of our country had simply told the truth concerning its own discoveries in the area of climate change 25 years ago and had not, instead, used its considerable reputation, resources, and influence to undermine the same opinions being developed by other scientists in university and government labs thoughout those 25 years since 1990. A few thoughts of my own on this question will follow. If Exxon had continued to tell the truth 25 years ago, our atmosphere today would contain a significantly lower level of CO2 – now passing the 400 ppm mark which is 40% greater than is was at the onset of the Industrial age. Back in 1990, the background level of CO2 was 353. During the last 25 years annual emission rates have continuously increased throughout the world thereby causing that 50 ppm additional increase in that most recent 25-year period. In addition, annual emission rates are still increasing today – they have not yet even leveled off. Surely with help – instead of the hindrance – that might have been provided by Exxon over the last 25 years, we would have by now stabilized and even reduced CO2 emissions by today. Instead, we simply watch those emissions continue to rise today and blame it on other countries, such a China and India, who understandably had looked for leadership from the developed countries that are largely responsible for creating the elevated CO2 levels we have today. Clearly, the general public of the USA has also been remiss in going along with the comforting, but misleading advice provided by ExxonMobil and the likes of Rush Limbaugh and not that provided by all of our scientific academies. The tragedy of all of this was clearly laid out in the 5th point explained under the “Science Basics” tab at the top of this web site. That point was explained with use of the figure shown below. As was more thoroughly explained in “Science Basics”, in order to prevent global surface temperatures from increasing by more than 2 degrees centigrade, future emission rates will have to be reduced as shown to the right side of “Today”. 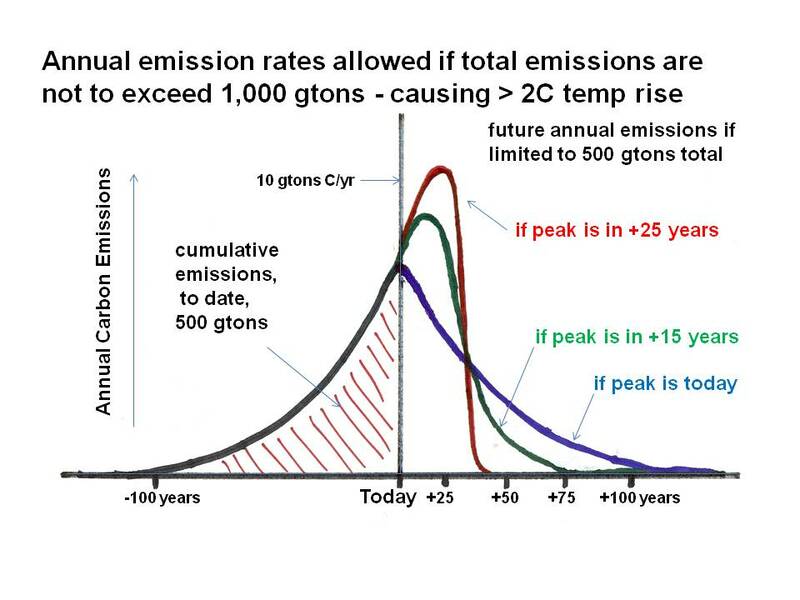 How rapidly those emissions must be reduced strongly depends on the date of our “peak emission” rate. If that date were today, our future reductions would have been doable as shown by the blue curve. We are not on that course, however. Emission rates continue to increase every year. Thus we are on a course described either by the green curve or perhaps the red curve for which the year of when our global emissions are leveled and thereafter decreased. In both of these cases, future reductions in emissions will have to be so extreme as to render them exceedingly difficult or even impossible. If Exxon had told the truth 25 years ago, it is very likely that we would have managed to stay on a course in which the peak emissions rate was achieve either by Today or sooner. In that case future emissions reductions throughout the 21st Century would have been doable as shown by the blue curve. Thus we find ourselves today facing a task that is either exceedingly difficult or not even possible – depending on when exactly our peak year is reached. All of this because Exxon decided to place a higher priority on its short-term financial gains over the last 25 years and, even worse, did their very best to prevent any efforts to reduce those annual emissions. From the recent Citizen United ruling of our Supreme Court, we learned that Corporations deserve the rights of individual citizens. I hope that also means that they should be held responsible for criminal behavior intentionally perpetrated on their fellow citizens. If the words we use to formulate the laws of our country have any meaning, ExxonMobil should be forceful prosecuted for intentionally doing great harm to our environment and the public. I can not think of a greater, more profound and more lasting disservice ever perpetrated on human beings. « Something we should do right now – Prosecute!